Chicks with this impediment have difficulty walking and often scoot around or limp if only one foot is affected. Their feet can be severely curled to the inside on one or both feet. Regardless of the degree of disability this needs to be addressed quickly. Often the chick only needs assistance for a day or two to resume a normal life. 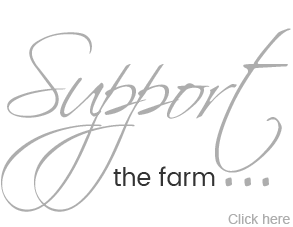 Causes: can range from nutritional deficiencies, temperature fluctuations during development, injury or even slick flooring conditions after hatching. If you discover it’s the flooring conditions in the brooder this will need to be addressed. I like using rubber mats that have a soft texture and are easy to clean and give the babies something to grip and have traction. These can be found at many stores or online. Paper towels can also be used. Vetrap (you can use any firm material with enough elasticity and comfort to allow the chick to walk including stretchy bandaids, hair ties, etc) I always have vetrap on hand so it’s what I reach for first, also some babies are prone to pecking at anything red so I avoid using this color vetrap. Vitamins approved for chicks (follow directions on bottle). If possible, a different brooder to keep the injured chick separate so it won’t get picked on while it’s recovering. The goal is to create a splint or brace that will keep the chicks toes splayed properly. Take care not to cut off circulation or make it so tight the chick can’t walk or gets injured further. 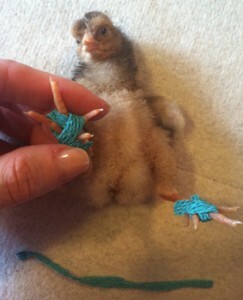 There are several ways to secure the toes so don’t be hard on yourself if it takes a few tries with a wiggling chick. Observe the chicks feet to see the severity. Sometimes it affects them further up the to their ankles and they may need extra support there are well. Cut the vetrap into two strips – you’ll may need to measure depending on what breed or species of bird you have. Placing the chick on its back (presuming you’re alone doing this), gently splay the foot out in what should be its natural position – look at healthy chicks as a model, if necessary. Wrap each foot and toes so they display naturally. Usually the chicks are ready to run on their own in less than 48 hours.